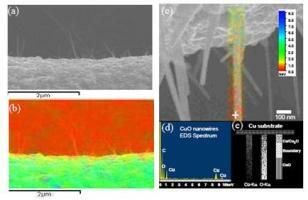 In this study we are able, using a copper grid substrate, to successfully grow separate nanowires with a high level of crystalline in plane CuO nanowires, for a length of up to ten micrometers. The confocal Raman spectra of a single CuO nanowire permit direct observation of the nature of an individual CuO nanowire. The observed structural information is also consistent with the energy dispersive x-ray spectroscopic mapping and supports the conclusion that the growth of CuO nanowires occurs through the short-circuit diffusion mechanism. Two dimensional Raman mapping results for different types of CuO nanowires confirm the expected outcome, reducing of the diameter of a cylindrical cross section of a single nanowire results in Raman frequency downshifts that can be explained by the bond polarizability model. An obviously steady blue shift of the photoluminescence (PL) peak has been attributed to nanosized effect. Higher surface to volume ratio and enhanced surface defects along the growth direction of the nanowire might be responsible for the observed PL behavior. The applicability of investigating the size effects of the phonon confinement and growth mechanism in a single CuO nanowire without any preparation for different sizes such as nanoparticles is possible because the detection is relatively straightforward and the reproduced signals can be observed. The integrated studies in the growth mechanism of a single nanowire, optical measurements, and theoretical modeling and in plane nanowires fabrication technology will lead to a more encouraging development in nano-industry.